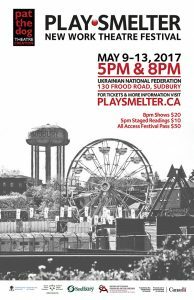 Sudbury, ON – Tickets are now available for PlaySmelter 2017, Sudbury’s new work theatre festival. To celebrate its fifth year, the festival will be presenting the world premiere production of Blind Nickel Pig by Lara Bradley and the Sudbury premiere of Receiver of Wreck by Matthew Heiti. Accompanying these full productions will be exciting first readings of three new scripts by Northern Ontario writers: Pakistani Sugar by Brigitte Gall (Minden, ON), Debwewin (Truth) by Sarah Gartshore (Sudbury, ON) and The Sandcastle by Eli Chilton (Moose Factory, ON). All events will take place May 9-13 at the Ukrainian National Federation, 130 Frood Road. Matthew Heiti’s Receiver of Wreck is a grotesque love story about two people who each lose something at the same moment and are sent crashing together toward the dark heart of Canada. Inspired by the Salish Sea human foot discoveries, Receiver of Wreck is story about human waste and the mystic potential of change. This year’s festival also includes Northern Ontario’s first-ever Producers’ Unit. This select group will be mentored on how to build independent theatre productions from the ground up, with the aim to assist the creation of new theatrical works in our community and is funded by Canada Council for the Arts. All scripts presented at the PlaySmelter New Work Festival have been developed at Pat the Dog Theatre Creation. Tickets and the full festival program are available at www.playsmelter.ca. The PlaySmelter Festival is produced by Pat the Dog Theatre Creation (www.patthedog.org). PTD is dedicated to the support and advocacy of playwrights and their plays, and is the only playwright creation centre in Ontario open to both established and emerging artists.